This brand new all-inclusive resort offers the perfect beachfront getaway for families. All rooms and suites offer ocean views and ensure comfort with a private balcony or terrace, fully stocked mini-bar and daily maid service. The resort is ideally located close to the wonders of the Mayan Riviera and right next door to the Puerto Cancun Golf Club. An Explorer's Club for Kids, Core Zone Teen Club and surf pool offer young guests endless opportunities for fun, while adults can enjoy a welcome respite at the rooftop pool and Sunscape Spa by Pevonia®. Elevate your vacation experience with an upgrade to the Sun Club and receive upgraded amenities and exclusive privileges including personalized check-in, 24-hour room service, access to the Blue Water Grill for lunch and the Sun Club Lounge as well as complimentary access to the hydrotherapy spa area once per stay. Set beachfront along the Caribbean Sea, the resort is 12.5 miles from the Cancun International Airport. 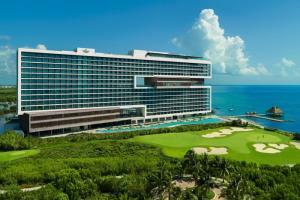 Located near the wonders and ruins of the Mayan Riviera and adjacent to the Puerto Cancun Golf Club.